You are here: Home / Latest Physics Assignments / Collisions / What Is a Collision? In everyday language, a collision occurs when objects crash into each other. Although we will refine that definition, it conveys the meaning well enough and covers common collisions, such as those between billiard balls, a hammer and a nail, and too commonly automobiles. shows the lasting result of a collision (an impressive crash) that occurred about 20,000 years ago. Collisions range from the microscopic scale of subatomic particles to the astronomic scale of colliding stars and colliding galaxies. 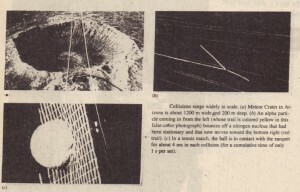 Even when they occur on a human scale, they are often too brief to be visible, although they involve significant distortion of the colliding bodies. We must be able to distinguish times that are before, during, and after a collision, as suggested in . 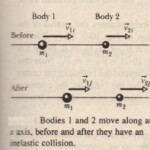 That figure shows a system of two colliding bodies and indicates that the forces the bodies exert on each other are internal to the system. Many physicists today spend their time playing what we can call the collision game. 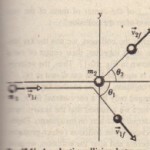 A principal goal of this game is to find out as much as possible about the forces that act during a collision, from knowledge of the state of the particles before and after the collision. Virtually. all our understanding of the subatomic world electrons, protons, neutrons, muons, quarks, and the like comes from experiments involving collisions. The rules of the game are the laws of conservation of momentum and of energy.